As the manhunt for the 17-year-old suspect in Wednesday's deadly apartment shooting continued into Thursday, the 1-year-old girl who was critically wounded in the attack opened her eyes for the first time since she was shot. Zoey Duncan is doing well after undergoing emergency surgery, said her uncle, Derrick Shaw. The child was shot when a gunman came into her apartment in College Hill Courts and opened fire around 1 a.m. Wednesday. Talitha Bowman, 20, was killed in the attack, and two other people -- including Zoey's mother -- were injured. 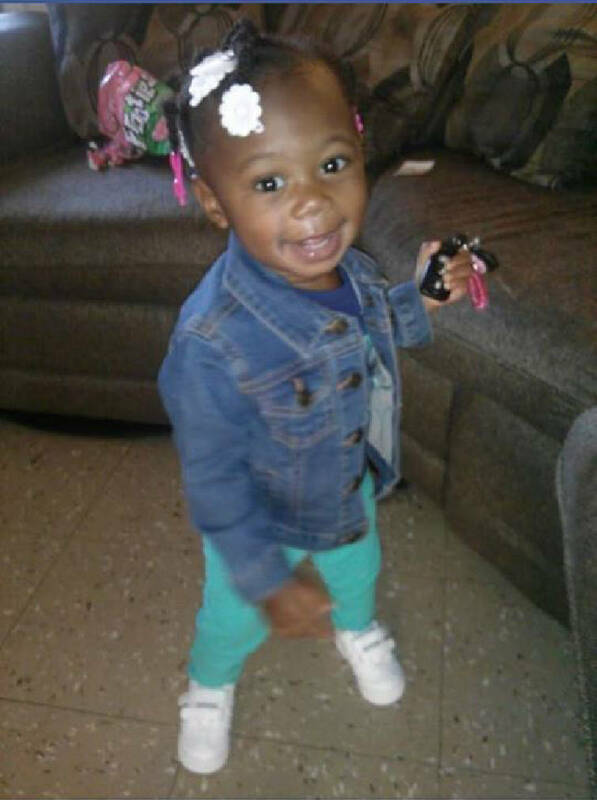 Zoey Duncan, 1, was shot and critically wounded early Tuesday when a shooter came into an apartment in College Hill Courts and opened fire. While Zoey is in stable condition, Shaw said the family won't know for six or seven days whether she will be paralyzed from her injury. "The doctor said it's in the hands of the Lord," Shaw said. "But I believe that God will heal her and she will walk again. We are not accepting that she is paralyzed." On Thursday, police were still searching for the man witnesses said pulled the trigger during the attack -- 17-year-old gang member Cortez Sims. Although Sims is a juvenile, police obtained special permission to release his name and photo so the community could assist in the search, Police Chief Fred Fletcher said. "We just felt this was such a public safety issue that we needed to do everything we could to get him into custody," Fletcher said. Sims' sister declined to speak with the Times Free Press on Thursday, but did say she thinks her brother is innocent. Fletcher said the department's fugitive team has been canvassing and searching homes where Sims could be, and is using a variety of techniques to track him down. "A big chunk of what we're doing involves tools and techniques that we can't disclose because that would jeopardize our ability to find the next person," Fletcher said. On Thursday, the Tennessee Bureau of Investigation added Sims to its Top 10 Most Wanted list. The agency asked that anyone with information about Sims' whereabouts call 1-800-TBI-FIND. Michael Knight, a special agent and public information officer at the U.S. Bureau of Alcohol, Tobacco, Firearms and Explosives, said cooperation and information-sharing between agencies is crucial in any manhunt. "It's important to share the information about the individual in case the individual leaves the Chattanooga area," he said. He added that searches for fugitives do not have a clear-cut crucial window of time -- like 24 or 48 hours. "That may be pertinent in a kidnapping or something time-sensitive, but when it comes to someone who is wanted, there is really no time frame," he said. Law officers wouldn't say whether they believe Sims is still in Chattanooga. Social media can also play an important part in searches, Knight said, both as an investigative tool and as a way to put out information about the suspect. Sims maintained an active presence on social media but apparently hasn't posted since the shooting. On Dec. 19, he posted song lyrics from a Chicago rapper to one of his Facebook profiles. "I'm from where ... Mothers don't care & baby's get killed," he wrote. "Where you gotta rob & steal for stomachs To fill. #TheWorldAroundMe."